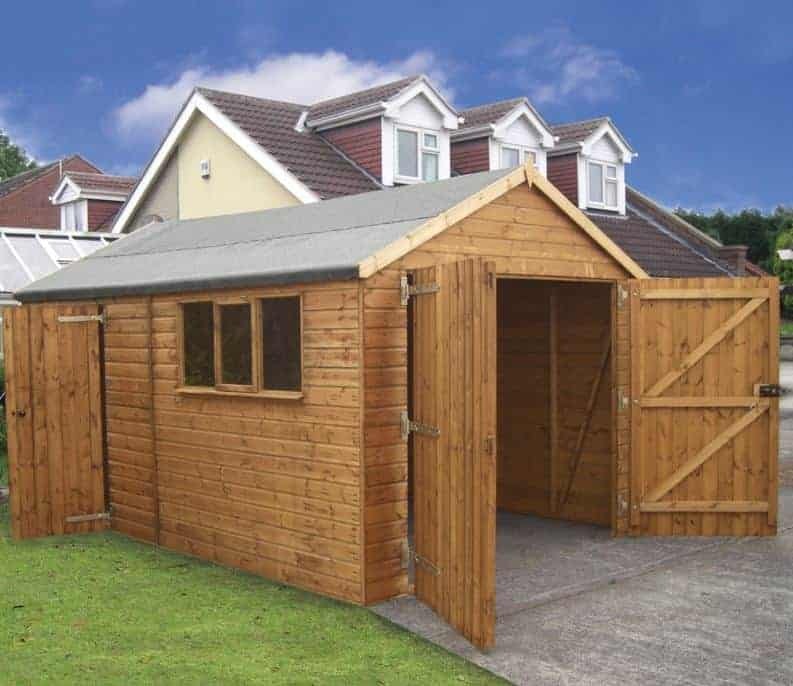 This traditional wooden garage not only makes an attractive addition to any property, it’s also well made and very versatile. It’s not only large it’s also tall, with a tall eaves and ridge height complementing the generous depth and width. This means that it’s a building that could also be used as a workshop, especially as it features a bank of three tough windows that let a good supply of both natural light and ventilation in. The very accommodating height is thanks to the felt clad apex roof, and this also performs the essential function of carrying rainwater away. Water repellency is also a feature of the very tough cladding, which we were pleased to see used for the roof as well as the walls. It means that the owner won’t have to worry about keeping their car or other contents dry. Getting in and out is also very easy, whether on two wheels or on foot, thanks to the large double doors at the front or the smaller personnel door which can be positioned on either side of the garage. It’s worth noting, however, that while both of these doors are padlockable neither of them come with a padlock as standard so this will need to be purchased separately. Garages are very practical buildings, but that doesn’t mean that they have to be plain or unsightly, which is why we liked the traditional appearance of this large timber garage. 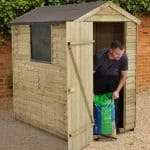 Whilst it makes a large and affordable place in which to store a standard sized car, it could easily be used as a workshop as well for either a home-operated business concern or for a hobby. One of the first things to strike us about this garage is just how tall it is, which isn’t always the case with similar buildings we review. The height is given by an apex roof, which we also found reassuringly tough thanks to the tongue and groove substrate covered in a strong grey mineral felt. The ridge height is 2.74m, which equates to 9 feet, and the eaves height is 1.85m. There’s also lots of room provided by the width and depth of the structure, which are 3.66m and 4.28m respectively. The cladding and frame are all important on a building as large as this, as that’s what creates stability. We were pleased therefore to find that the cladding used on the walls and roof was not only 12mm tongue and groove cladding, which is something we often see, but also that it is high quality planed all round cladding. PAR cladding is much stronger and more rigid than standard cladding, and that showed once the garage was assembled, particularly as it also boasts thicker than average 44 X 44mm heavy duty framing. 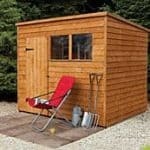 As with most timber garages there is no floor included as it’s designed to go onto a level area of concrete. There is, however, a timber base rail so that a board floor can be installed for noise reduction purposes if you plan to use it as a workshop. With such high quality cladding used, and at this price range, we would expect it to be backed up by a long anti-rot guarantee. Unfortunately that’s missing on this occasion, with only a very basic one year guarantee offered rather than the ten or fifteen year guarantees we often find on cheaper buildings. The reason for this is that the manufacturer has only used a dip preservative treatment rather than the longer lasting pressure treatment we always like to see. Another result of this is that the owner has to re-treat the garage themselves within 6 weeks of installing it, and every year after that. Over time, this requirement can become both laborious and costly. We liked the fact that this garage not only has a very large set of hinged double doors, which open to a width of 2.13m and have a height of 1.88m, it also has a single sized access door at the rear. This gives added convenience, and it’s good to see that both doors are fully braced and reassuringly strong as well. Another positive point are the three windows featured in one bank which, like the personnel door, can be positioned on either side of the garage. Whilst two are fixed in position, one is fully opening and this creates an easy way to ventilate the interior. The result is that it’s a light and pleasant environment to spent time in, which is essential if you want to use it as an area to work in. Whilst windows can potentially be a weak point for a workshop or garage, we were pleased to find that these all featured tough horticultural glazing. Whilst it looks the same as standard glass it’s actually tougher and less likely to shatter upon impact. That’s a security positive, but on the negative side we were disappointed to find that there were no padlocks included even though both doors are padlock ready. 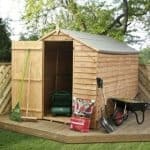 These are a must purchase for buyers of this shed, but we would much rather that they’d been included at the point of sale. Whilst we felt the one opening window provides enough ventilation for everyday purposes, on hot days or if machinery is running extra ventilation can be useful. That’s why we were pleased to see an option to upgrade one of the fixed windows to another opening window. 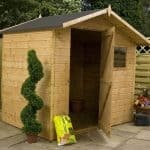 There’s also the option to have no windows at all, for those looking for a large security shed that keeps its contents hidden from passers by. One final option is a professional assembly service; it costs just under four hundred pounds, but it may still be a popular choice for customers whose time is at a premium. The PAR cladding wasn’t the only indicator that this timber garage had been made to a very high standard, as there were also chamfered edges on the corners to give extra strength. If the timber had been pressure treated before delivery, then we feel it would have been very long lasting. As it is, there’s the potential for durability to be compromised by customers who fail to adhere to the re-treatment schedule. As garages go this is distinctly mid-sized, but there’s still lots of room to move around in, especially with the tall eaves height. The size of the garage means that at least two people are needed for the assembly, and it can still take one or two days. 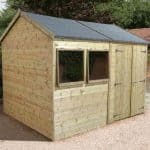 We are impressed by the high quality of this garage, but at this price we would have liked to see it come with a longer warranty period and a secure locking system. Final Thoughts: For lovers of traditional timber designs this garage is highly attractive, and it’s also reasonably priced given its size. 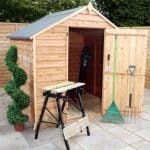 The downside, however, is that there’s a significant emphasis on the customer to retreat the garage with wood preserver every year, as well as just six weeks after assembling it. If you don’t mind the work this involves, then this garage has a lot to recommend it. Because the interior is so comfortable, thanks to its generous headroom and the light and ventilation provided by the windows, we feel this building also deserves consideration by those who are looking for a wooden workshop.